This is an ancient status surname, of Norman pre10th century origins. Derived from the Olde French 'Ussier' and introduced into England after the 1066 Invasion, and Ireland after 1170, the name is job descriptive for one of the most important positions in a royal or noble household. In the status listing, the "ussier" was above the marshall, and second only to the Steward of the household. The usher however, was responsible for deciding who was to be admitted to the royal or noble presence, a position of considerable authority, and one which could be abused. 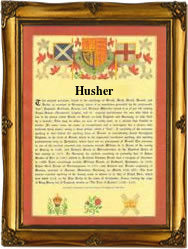 As a surname it is recorded in the spellings of Usher, Ussher, Husher and Lusher. The latter being an early example of the English habit of slang. "Lusher" being created from Le Ussier. Amongst the earliest examples of the surname recordings are those of William Le Ussier, also recorded as William Lussier, of Somerset in 1243, and Adam Husser of Cumberland in 1332. Interestingly 'Usher' was one of the earliest recorded surnames into the New American colonies in the 17th century, John Usher aged 26, being an emigrant to Virginia Colony in January 1634. The first recorded spelling of the family name is believed to be that of Richard Ussier. This was dated 1216, in the rolls of the monastery of Colchester, Essex, during the reign of King Henry III, known as " The Frenchman", who reigned from 1216 to 1272.